Dallying In The Dirt, Issue #202--- A tale of Lotus, late hibiscus and dead house plants. I took a very different approach to my large Hibiscus tree this year. I had decided it was too big and that I had fought with it long enough, so I determined that it would stay outside for the winter and let the elements deal with it. I had a new Hibiscus with more colourful flowers taking up the Hibiscus winter space in the solarium. After we had a few light frosts in the fall and all of the big Hibiscus leaves had been frozen and fallen off, I had a couple of people ask if they could have it. I dragged it indoors and severely cut it back. Not surprisingly, nobody ever came to collect it and it was a bit large for me to transport, so there it sat in the corner of the Solarium looking like a collection of dead sticks. A couple of weeks later it gave some indication that it might survive. Here it is now with lovely, green, new growth, bursting forth all over it. A friend dropped by just before Christmas and told me that the nursery she had worked at did this as a matter of course. If all of the leaves have been frozen and fallen off then the vast majority of insects have also been dealt with. It seems to be working but we will keep an eye out for Spider Mites as the winter progresses. Not everything I do turns out well. Over the many years that I have dealt with plants indoors, I have always recommended the Spathyphyllum spp. as being some of the best houseplants. I did so in last week’s questions. They thrive in low light and they are quite difficult to kill. Apparently not so. They will wilt quite badly if they are allowed to dry out but recover quickly if watered soon enough. I have often stood them in a puddle of water to rehydrate them and their soil. Apparently you can over water them. This poor fellow was standing in a puddle of water for several days. The difference being how it got there. If I stick a dry plant into a puddle then it will happily absorb that water. 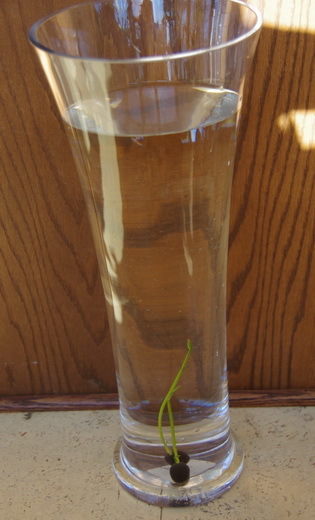 If I pour too much water into the top of the plant and it creates a puddle at the bottom, then that stops the excess water from draining out of the soil. The air spaces in the soil are now filled with water and the plant literally drowns. 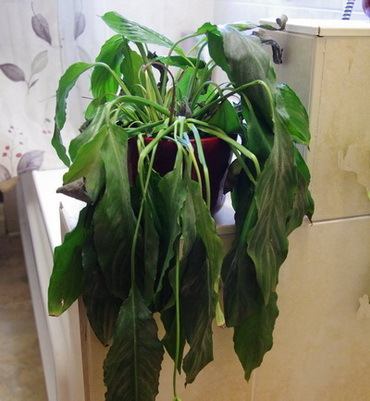 I had always pulled this plant out if its pretty container to water it and even put it back into a bit of a puddle. I changed and watered it in the container and the excess couldn’t escape from the soil and you can see the result. Apparently I’m never too old to learn. On a much happier not I have a couple of tiny plants growing in a tall vase of water. A friend of mine, who loves to try out exotic seeds to see what she can grow, brought me these two germinated seeds this week. They are Nelumbo lutea the American Lotus. I have tried to grow Lotus in my ponds a couple of times. They are amazing plants with beautiful flowers. They have never successfully overwintered. V. found these seeds on one of her garden trips and brought them home. She has done the hard work of getting them to germinate. They have two very hard seed coats and because of that they will stay dormant and viable for many years. Only when the conditions are correct will the seed coat erode and the new plants emerge. V. followed the instructions and worked the seed coats with sandpaper. Once they germinate they grow quite quickly and apparently will make up to 38 cm, (15") in less than two weeks and then they start to put up the distinctive floating leaves. The instructions indicated that after the first four leaves have reached the surface, they then don’t like to be moved to a different depth of water. Thus the tall vase in the picture. It has about 35 cm of water in it because that’s how deep they will have to be when they make it out to the ponds in the spring. It is going to be an interesting experiment. We maybe should have started a little later in winter but it will be fun to watch. John Contributes I have found one practical use for the floral foam, and that is as a strainer at the bottom of various pots. I carve/ break-off a piece of foam just a little larger than the drainage hole(s) at the bottom of the pot I am about to use, slightly press it into place, and then add drainage and soil as required for the plant. I have found this method better than either rocks, moss, screen and everything else that I have tried over the years, primarily for two reasons: 1) it also acts as a great filter to prevent solid washing through and even though I have some pots where it's been in place for years, it does not get plugged or rot away and 2) if it's pushed/ twisted tightly into place (but not so much as to crush/ compress it), then I have found that pill bugs and the like are severely reduced from finding a home in the rootball (a big problem for me as almost all of my plants spend the summer outside. Ken Answers! Thanks John for that useful bit of information. If it keeps the pill bugs / sow bugs out of the pots, I will be trying it out. Rose Asks? My Pineapple Lily is indoors right now, just finished giving me three beautiful blooms. I put it out in the summer, get nothing, except long (daylily type leaves), and after I bring it in in the fall, it blooms through Nov/Dec/Jan. What do I do with it now? I seem to think I should give it a rest period, downstairs, in the dark, with no water. For how long? Then bring it up, and start all over again! Correct? Ken Answers! One of the joys of gardening and sharing it with my readers is the interesting stories that I hear such as this one. Nothing you read, would ever indicate that a Eucomis sp, (Pineapple Lily) would bloom indoors through the late fall and early winter. I can only surmise that it didn’t get an early enough start in the spring. Enjoy your oddity. You have a couple of choices. Move it to the cool dark place now and dry it out or be really bold and keep it where it is and see if it ever naturally goes dormant. 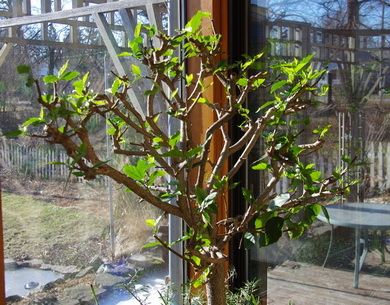 In either case start watering it again early next spring and move it outside when you are frost free. Have fun.